"Who watches the Watchmen?" This is the ever-encompassing tag line that we always remembered with the most celebrated graphic novel. Watchmen is the only graphic novel to ever be included in Time's 100 Greatest Novels of All Time. That is how good the original content is and reading it a few years back, we can attest that this is probably one of the most meticulously made comics not only in its plot, its characters and setting but also in its art. "Watchmen" the film adaptation has big shoes to fill in and honestly, hype is a big downer. But as what we always say to our friends, hype can make or break a film but a truly great film can overcome any hype. Can "Watchmen" be the Hail Mary pass, the holy grail of comic book adaptations? Be one of the first few to know! Read on! 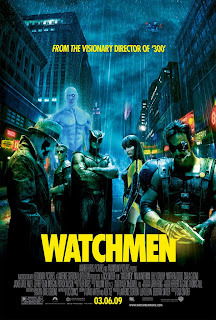 "Watchmen" is set on an alternate reality in which it is similar to the tumultuous 80's we know and read about. The big difference though is that there are superheroes present unlike our real world. The primary superheroes are the Watchmen and they are all retired due to a proclamation by Congress that vigilante heroes should be banned and outlawed. Trouble brews as one of the Watchmen, The Comedian, is suddenly assassinated and Rorschach (also a member of the group) investigates further the death. He believes that the killing will not stop with The Comedian and someone is out there to kill them one by one. Now Rorschach, with his remaining colleagues, needs to find the killer before they are all eliminated. Can they find the culprit on time? Is the world doomed to a nuclear holocuast? Now as for the verdict of one of the most anticipated films this year, the film did not disappoint and fans or non-fans will appreciate this film and it is a testament to the talents of Alan Moore. Even with the Philippine release being rumored to be heavily cut (around 20 minutes of theatrical footage) to get a rating below R18, the show did not lose any luster in any form. A lot of gore are still present mind you. So props to the MTRCB or whoever made the cuts, it was well-made and well-placed except for one instance. The film stayed true to form to its graphic novel brethren. Hearing line after line from Rorschach brought alot of nostalgic and deja vu moments. Although we still recommend the original to this one, this is still one accurate adaptation. You have got to see it to believe it. Heck, even the characters's faces are almost identical to what Dave Gibbons drew and John Higgins painted. The new ending was also a good conclusion to the film and does not affect the material negatively; in our opinion, it might be even a better ending than the original. Acting was really superb even is the cast was not star-studded with known names. Finally, the sound was exceptional with a mix of well known songs and awe-inspiring background music. Sounds effects were pretty effective too as punches and kicks really sound bone-crunchingly hurtful. The "Watchmen" shouldn't be missed by anyone, P-E-R-I-O-D. It is a testament to man's creativity and talents. The story was superb as expected, the scenes were just amazing and the lines, the lines were perfect and deep. So back to the question, "Who watches the Watchmen?". The answer is simple: every single human being. Thanks to this superb adaptation. - the most anticipated and hyped up film of the year just delivered big time!